the first club™ - eBooks - Oaks Physiological Ecology. Exploring the Functional Diversity of Genus Quercus L.
With more than 500 species distributed all around the Northern Hemisphere, the genus Quercus L. is a dominant element of a wide variety of habitats including temperate, tropical, subtropical and mediterranean forests and woodlands. As the fossil record reflects, oaks were usual from the Oligocene onwards, showing the high ability of the genus to colonize new and different habitats. 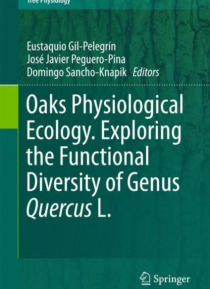 Such diversit… y and ecological amplitude makes genus Quercus an excellent framework for comparative ecophysiological studies, allowing the analysis of many mechanisms that are found in different oaks at different level (leaf or stem). The combination of several morphological and physiological attributes defines the existence of different functional types within the genus, which are characteristic of specific phytoclimates. From a landscape perspective, oak forests and woodlands are threatened by many factors that can compromise their future: a limited regeneration, massive decline processes, mostly triggered by adverse climatic events or the competence with other broad-leaved trees and conifer species. The knowledge of all these facts can allow for a better management of the oak forests in the future.